If you’ve been eyeing up that lemon meringue pie recipe and you’re not too sure how to get the best meringue possible then have a read of this before you try it! For those of you that have had meringue or egg white mishaps then these tips are for you. Here’s how to get the very best from your egg whites, from what they do, how they grow, what to use and how to stabilise them! Egg whites (also known as glair(e) or albumen) whisked or whipped at room temperature foam more easily giving you a much better result when beaten. 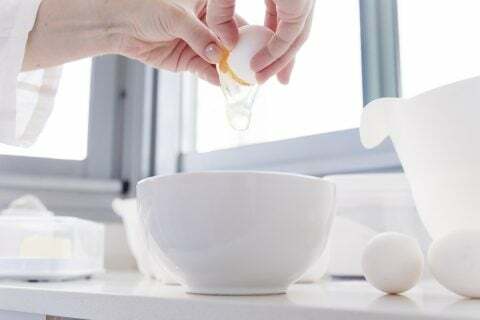 If grease from a bowl or yolk from an egg has entered into your egg whites then get rid and start again, the reason being is that any amount of fat contained in the egg whites will prevent the white from foaming! The whites should be used immediately after you have whipped them; otherwise, they start to deflate, lose volume and stability. Egg whites when whisked can grow up to 6-8 times in size, so a rule of thumb is to use it or lose it! Some recipes call for cream of tartar to be used; this helps to stabilise the egg whites and holds it in shape thus preventing weeping and giving you a much sturdier meringue. Alternative stabilisers such as sugar, lemon juice or white vinegar can also be used and will help stabilise them for a while longer by holding in the water and air controlling the volume of the whites. NextNextTop 10 tools used for cake decorating.